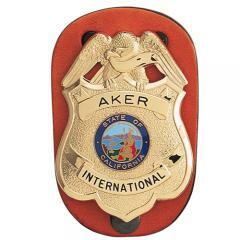 The Aker 590 Clip-On Federal Badge Holder fits Federal law enforcement badges, and is designed for concealability while on covert operations. Its low-profile black clip allows it to be worn discreetly on an inside-the-waistband carrier without printing through your pants. It can also be displayed more openly, and fits a belt measuring up to 1.75 inches wide securely. The holder is made from premium cowhide leather and comes in black or tan. The choice of materials makes it extremely durable and wear resistant, capable of standing up to harsh conditions with ease.